Hello, my name is Lisa and I’m a yarnaholic. I spend my entire day thinking about it. I gotta have it. I scheme and dream about it. I find myself wanting to use it early in the morning. I want to use it late into the night. I am powerless to stop. I have a day job, I get an hour for lunch. I spend nearly 90% of those lunch hours in search of it. I really have a problem. I found a new yarn shop near my office. They have new-to-me brands and styles and colors and OOOH how I love to try them all! My stash is growing exponentially. My husband is going to need a new place to sleep if I keep up my yarn addiction at this pace. My entire little white house EXPLODES in a massive tangle of rainbow colored yarn streamers like fireworks. Yeah, I’m kinda goofy like that. So, I hope my sweet man will not move out of the house displaced by yarn. But I just could not resist the urge to buy some stash yarn for the NEXT BIG THING. Because each creation is THE NEXT BIG THING. I am scheming a new afghan. What can I say? At least it keeps me out of trouble. 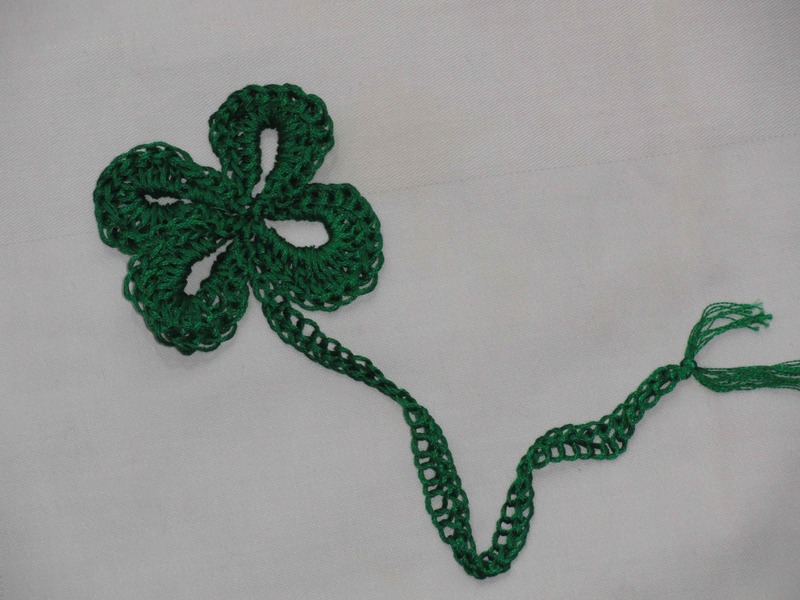 But for right now, we have St. Patrick’s Day arriving soon and I have made a bookmark. Not quite as exciting as the exploding yarn, but meh, it DID keep me out of trouble for a little while. It goes well with my book addiction.